A Full Day of Nature Sightseeing & Relaxation in the Hot Springs. This Arenal Combo Tour is a perfect excursion for all those looking to see and do as much as possible in one day! You start your day when you are picked up from your hotel and driven to the Arenal rainforest hanging bridges. 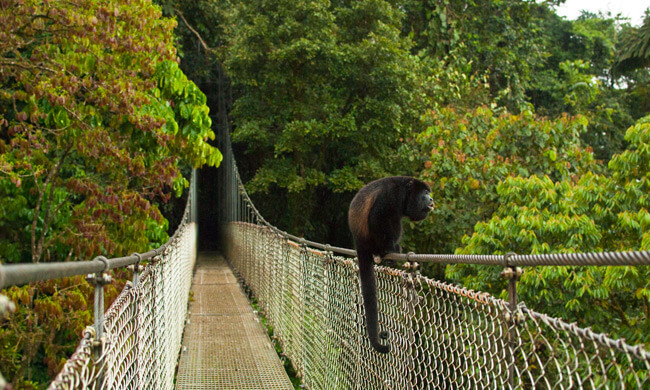 Here your guide will take you on a 2.5 hour walk along 16 hanging bridges over three kilometers where you can get in close contact with the flora and fauna found in the Costa Rican rainforests. Then onto the amazing La Fortuna Waterfall at the base of the dormant volcano Cerro Chato. A 20-minute hike and you’re down at the foot of the 70-meter-high La Fortuna waterfall. Here you can swim in the natural pool. Finally head to Ecotermales hot springs, the smallest springs in the area, accepting no more than 100 visitors at a time. Thermal hot springs are famous for their therapeutic benefits since ancient times and known for helping to relieve stress and tension in both body and mind while detoxing the skin. Owned by a local family, the Higaldos, Ecotermales has four thermal hot spring pools with temperatures varying between 91º F and 105ºF. After the springs, enjoy an authentic Costa Rican meal at the on-site restaurant before heading back to your hotel with amazing memories of your day of adventure in Arenal! This tour requires physically good condition with 7-8 hours of walking and a 13 hour day in total. Your tour includes: transportation, entrance fees, lunch, dinner. What to bring: change of clothes, swimsuit, sunscreen, towel, insect repellent. Note: This tour is also available for the same prices with a Safari Float tour of the Peñas Blancas River instead of the Hanging Bridges. Check with your Travel Consultant for details.